My research for this article led me to some very interesting facts. The following information was taken from history.com (Veterans Day Facts). “Veterans Day originated as “Armistice Day” on Nov. 11, 1919, the first anniversary of the end of World War I. Congress passed a resolution in 1926 for an annual observance, and Nov. 11 became a national holiday beginning in 1938. Veterans Day is not to be confused with Memorial Day–a common misunderstanding, according to the U.S. Department of Veterans Affairs. Memorial Day (the fourth Monday in May) honors American service members who died in service to their country or as a result of injuries incurred during battle, while Veterans Day pays tribute to all American veterans–living or dead–but especially gives thanks to living veterans who served their country honorably during war or peacetime. 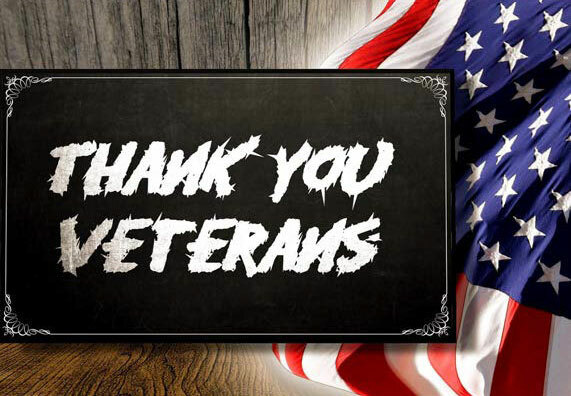 In 1954, President Eisenhower officially changed the name of the holiday from Armistice Day to Veterans Day. In 1968, the Uniform Holidays Bill was passed by Congress, which moved the celebration of Veterans Day to the fourth Monday in October. The law went into effect in 1971, but in 1975 President Ford returned Veterans Day to November 11, due to the important historical significance of the date. A November 10, 2014 article in U.S. News and World Report cited some other noteworthy facts. “High school is the highest level of formal education for many U.S. veterans, in part because they can join the military at 18 and sacrifice the college years that middle-class Americans sometimes take for granted. Years later when they return to civilian life the age difference with younger college students can make integration difficult, and some merely want to get a job and make money. As a result, 92 percent of veterans the age of 25 or older have a high school diploma, while only 26 percent of veterans in that age range have a bachelor’s degree, according to the Census Bureau. Online college courses are being offered to veterans to help combat this education deficit. From unemployment to health care and homelessness, Veterans are without doubt America’s forgotten heroes. It is heartbreaking to learn of the treatment many endure once they retire from active duty. They have paid a personal price silver and gold cannot reimburse. Time away from family, friends, and loved ones is time that cannot be recaptured. Millions of veterans spent their youthful years protecting the freedom the world envies instead of enjoying the fruit that freedom in America has to offer. Our veterans have undergirded the foundation that makes the American Dream a reality for all ethnic groups. They are worthy of perpetual honor. I encourage those of us who are not veterans to make an extra effort not only on Veterans Day 2016, but on everyday the opportunity presents itself, to show appreciation to the men and women who have served and are serving our nation. Purchasing a meal, opening a door and/or a simple thank you is the least we can do to perpetually show appreciation. Written by Henry L. Hopson Jr.